Russian President Vladimir Putin, with whom Trump has said he hopes to “get along,” is a former foreign intelligence officer and lieutenant colonel in the KGB. In the 1980s, Kennedy was “terribly misguided” and “a fool” for seeing Reagan as a greater threat than either the leader of the Soviet Union or the head of its brutal secret police and intelligence agency, political science professor and writer Paul Kengor told The Daily Signal. As this reporter wrote in 2010, the story focused on a 1983 document from the spy agency detailing Kennedy’s overtures to top officials in the former Soviet Union. The Massachusetts Democrat had challenged President Jimmy Carter in the 1980 Democratic primaries and was considering the possibility of running again for president. Kennedy was considering another run for president in 1988, but did not rule out running in 1984, Chebrikov informed Andropov in the letter. Kennedy suggested he could work with the American news media to help organize favorable American press coverage for Andropov and other Soviet officials, according to the 1983 letter. Going a step further, according to the letter, Kennedy then offered up the possibility of having top media personalities such as Walter Cronkite, Barbara Walters, and Elton Raul, president of the board of the ABC television network, travel to Moscow to do television interviews with Andropov. “The senator underlined the importance that this initiative should be seen as coming from the American side,” the letter to Andropov says. It was not Tunney’s first trip to Moscow on behalf of Kennedy. He also visited the KGB in Moscow three years earlier, on March 5, 1980. 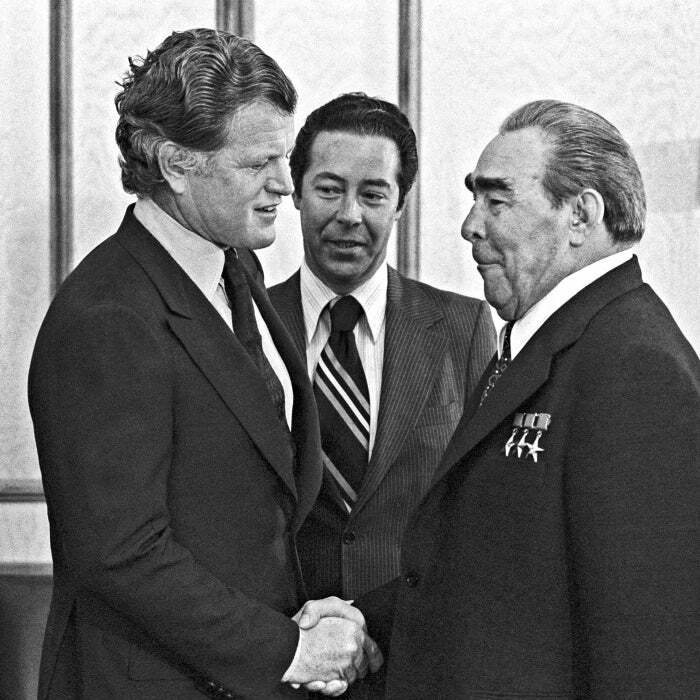 In that earlier visit, Tunney told KGB agents that Kennedy was impressed by the foreign policy statements made by General Secretary Leonid Brezhnev, Andropov’s immediate predecessor as the top Soviet leader. 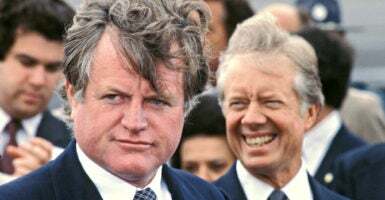 He said Kennedy blamed Carter for becoming overly belligerent toward the Soviets after they invaded Afghanistan in December 1979. Kennedy, an icon among Democrats who died in office in 2009, was first elected to the Senate in 1962 to fill the seat of brother John F. Kennedy when he became president. Kennedy’s history with the KGB, and the trips Tunney took to Moscow on his behalf, are documented in what are known as the Mitrokhin papers filed with the Cold War International History Project of the Woodrow Wilson Center in Washington, D.C.
Vasiliy Mitrokhin was a former KGB agent who defected to Britain from the Soviet Union in 1992. Mitrokhin continued to work with British intelligence until his death in 2004. Andropov died less than eight months after receiving the letter about Kennedy from his KGB head in 1983, and it is not clear if the Soviet Communist Party chief ever acted on the Democrat senator’s proposal. 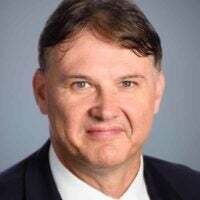 But what is clear from history is that Russian agents have worked with “dupes” such as Kennedy and other “naïve” Americans to influence U.S. policy to serve their own ends, Kengor, a Grove City College political science professor, told The Daily Signal. The lesson to be learned here is, don’t ever make the mistake of thinking that these KGB types are your buddies, and don’t make the mistake that because they are nice to you they are going to work for you in a positive way that’s good for your country. People in the KGB were schooled in the art of manipulation, misinformation. They know how to dupe people and they know how to use people. Kengor is the author of several books on Reagan, including “The Crusader: Ronald Reagan and the Fall of Communism,” which includes a copy of the entire 1983 KGB document. In his book, Kengor points out that Tunney, now 82, acknowledged making 15 separate trips to the Soviet Union. The California Democrat served as an emissary not just for Kennedy but for other U.S. senators. It’s not clear how many, but the KGB chief’s 1983 letter to Andropov says Kennedy suggested the Soviet leader meet with Sen. Mark Hatfield, an Oregon Republican who joined with Kennedy in supporting a freeze on nuclear weapons. Hatfield died in 2011. The KGB document that blew the lid off Kennedy’s overtures to the Soviets came to light in the early 1990s. Boris Yeltsin, the first president of the Russian Federation after the Soviet Union disintegrated in part because of Reagan’s economic and defense policies, opened the Kremlin archives. But this does say something about how terribly misguided Ted Kennedy was and what a fool he was for seeing a greater danger in Reagan than he did in Chebrikov, the head of the KGB, and in Andropov, the leader of the Soviet Union. Unless Trump surrounds himself with “Russian realists” who understand what they are up against with Putin, Kengor said, he is concerned Trump could be “duped” as many other U.S. policymakers have been. Trump has expressed admiration for some of Putin’s leadership qualities. “Personally, I don’t think Trump has the ideological and historical background to understand what he’s dealing with in a Russian president who has spent 16 years in the KGB,” Kengor said.